Industrialization is the development of industries in a country or region on a broad scale. This development has many advantages. The main advantage comes from the fact that industrialization gives us more goods that can be bought at affordable prices. When an economy industrializes, things are made more rapidly and in higher quantity. This means prices can go down and a lot of other goods can be made. A myriad of economic benefits stems from this particular development. As mentioned, the first advantage of industrialization is the growth of industries resulting from large scale production of goods which are sold to consumers at much affordable rates. 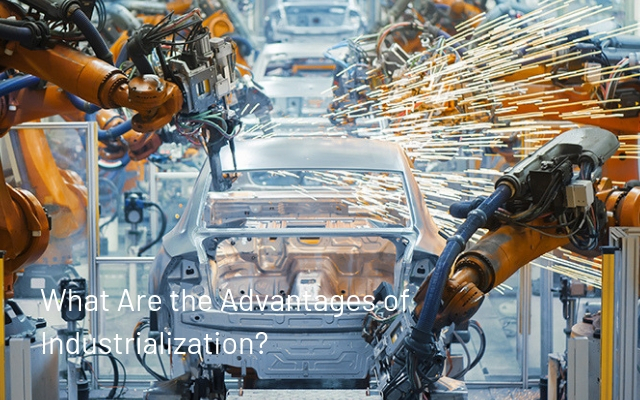 Through industrialization, machines help people do their work more quickly. As productivity is optimized, more products are made, and therefore, the surplus results in cheaper prices. Some may argue that this advantage is the most significant one as it affects economic growth immensely. Cheap goods are very convenient for consumers, and more ordinary people can avail them. Another advantage of industrialization is conservation of time. Not surprisingly, the business world goes by the famous saying of Benjamin Franklin “Time is money” because time is limited. No matter how we slice it, there are only 24 hours in a day. Unlike agrarian labor, factory work demands punctuality. People have to learn to live by the clock. Punctuality and productivity are principal goals. When industrial companies in an industrial estate like Science Park of the Philippines learn to take control of their time, they improve their ability to focus, and with this increased focus comes enhanced efficiency. Generally, it is a very desirable thing in business because good time management supposedly improves the bottom line. Additionally, industrialization has resulted in a substantial rise in the standard of living of people. Due to the presence of various industries, people are getting the newer type of products such as automobiles, furniture, appliances, clothes, etc. which improves the ordinary people’s standard of living. However, what does “standard of living” mean in this context? Economic historians would equate it to happiness but the impossibility of measuring happiness forces them to equate the standard of living with monetary measures such as real wages or real income. Without the technological changes of the industrialization, population growth could have been substantially reduced due to poor standard of living with only expensive goods available in the market. Additionally, industrialization provide means to control and check the gargantuan wastage of human energy that can be used somewhere else otherwise. Labor is also something in dire need of optimization. Misplaced labor not only costs more, but also hinders production to perform at the optimal level needed in fast-paced and vital industries. Every industrial company will try to achieve the optimal state by maximizing profits or by minimizing costs incurred in the production process. To execute this, conserving human energy is a vital component. Industrialization has also resulted in the expansion of new modes of transport making rapid import and export process possible. Many businesses have now started to compete on a global scale. Exporting and importing goods is not just the core of any large, successful business; it also helps economies grow and expand. The world has become a smaller and more connected place. With this development, a number of substitutes in consumer goods become available. Customers get wide variety of choices, which in turn results to an improved standard of living once more. Finally, industrialization creates new job opportunities, resulting to reduction of poverty to a great extent. It generates employment opportunities by developing industries for the people. At the same time, the usual areas that you can count on to increase business often are reduced in a tough economic environment. Consumers buy fewer goods. Businesses hire fewer employees who need insurance. Large insurance companies are relatively stable, but they can rely on downsizing to remain viable. For the most part, industrialization guarantees insurance for stability in people’s careers. After all, businesses and individuals alike need some sort of insurance no matter what state the economy is in.